2012-13 PANINI REPLAY BASKETBALL J.J REDICK. 2015-16 Panini replay J.J Redick Clippers. Spectra Indelible Ink Patch Auto 15/15. INDELIBLE INK PATCH AUTO 04/10. Encased & sealed with original Panini sticker. 2018-19 Panini Prizm Luka Doncic Freshman Phenoms Silver RC. The next rookie of the year and probably MVP. Kawhi Leonard basketball refractor card from the 2015-16 Prizm Basketball set. 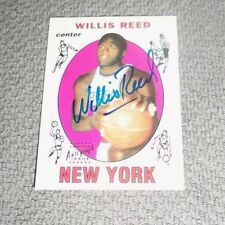 The card is in near mint condition and will be sent in a protective top loader. International postage is available and combined postage is also available. Feel free to check out my other sports cards and sports memorabilia. Thanks for looking. You are Buying a 2012-13 Panini Select Kevin Murphy Short Printed Authentic Prizm Refractor Autograph & Jersey Relic Rookie Card # 309. Player Kevin Murphy. Card Manufacturer Panini. Card is Serial # 079 / 199 and is Signed in Blue. Card Manufacturer Panini. 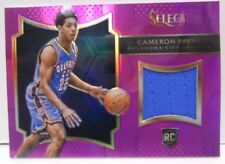 Card is Serial # 17 / 99 and the Jersey Piece is all Blue. Archie Bradley 2015 Bowmans Best Atomic Refractor. Card Manufacturer Panini. Card is Serial # 140 / 199 and is Signed in Blue. Jersey Piece is All Blue. Card Attributes Rookie. Card Attributes Autograph. Product Single. You are Buying a 2015-16 Panini Select Kevin Durant Short Printed Gold Prizm Refractor Insert Card # 66. Player Kevin Durant. Card Attributes Refractor. Card Manufacturer Panini. Team Golden State Warriors. Card Manufacturer Panini. Card is Signed in Blue. Jersey Piece is 3 Colored Black with a Grey & White Patch Piece. Card Attributes Rookie. Card Attributes Autograph. Product Single. You are Buying a 2012-13 Panini Select Quincy Acy Short Printed Authentic Prizm Refractor Autograph & Jersey Relic Rookie Card # 301. Player Quincy Acy. Card is Serial # 124 / 199 and is Signed in Blue. New Orleans Pelicans. DeMarcus Cousins. 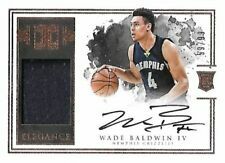 2017-18 Panini Impeccable. SP NUMBERED ONLY #49. Player Lonzo Ball. Card Manufacturer Panini. ORANGE REFRACTOR RC #80 43/49 BULLS. 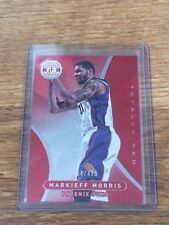 You are Buying a 2012-13 Panini Select Thomas Robinson Short Printed Authentic Prizm Refractor Autograph & Jersey Relic Rookie Card # 273. Player Thomas Robinson. Card Manufacturer Panini. Card is Serial # 029 / 199 and is Signed in Blue. Player Tim Hardaway. Card Manufacturer Panini. Card Attributes Refractor. Mint condition in protective case. Hall of Famer Paul Piece game worn jersey card with game wear on it...RARE FIND. You are Buying a 2012-13 Panini Select Reggie Jackson Short Printed Authentic Prizm Refractor Autograph & Jersey Relic Rookie Card # 257. Player Reggie Jackson. Card Manufacturer Panini. Card is Serial # 141 / 199 and is Signed in Blue. You are Buying a 2014-15 Panini Select Chris Anderson Short Printed Copper Prizm Refractor Insert Card # 259. Player Chris Anderson. Card Attributes Refractor. Card Manufacturer Panini. Card is Serial # 08 / 49. ZAZA PACHULIA. Player Zaza Pachulia. GOLD PRIZM REFRACTOR /10. 2016-17 PANINI NBA PRIZM. Card Attributes Refractor. Card Manufacturer Panini. Series Contenders. Professional Grader Beckett (BGS). Card Manufacturer Panini. Card Attributes Short Print (SP). Product Single. Card Number #25. Card Attributes Serial Numbered. Card Attributes Refractor. Player Kyrie Irving. SILVER PRIZM (REFRACTOR) PARALLEL. Team Boston Celtics. Card Attributes Silver Prizm Parallels. 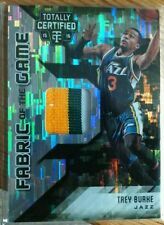 Series Panini Prizm Basketball. Card Attributes Refractor. Card Attributes Panini CS Sealed. Card Manufacturer Panini. Card Attributes Autograph. Card is Serial # 13 / 60 and the Jersey Piece is All Blue. Player IKE DIOGU. Card Attributes Refractor. Card Manufacturer Bowman. Team Golden State Warriors. Surface 9, centering, edges and corners all 9.5 ! Player Luka Doncic. Professional Grader Beckett (BGS). Series Prizm. Card Attributes Refractor. Card Manufacturer Panini. Card Number #199. Player Miles Bridges. Card Manufacturer Panini. Card Attributes Rookie. Card Attributes Serial Numbered. Player Javaris Crittenton. Card Attributes Refractor. Card is Serial # 134 / 199 and is Signed in Blue. Card Attributes Rookie. Card Attributes Autograph. Complete You Collection Now! Card Attributes Refractor. NO RESERVE! NRMINT/MINT CONDITION. Player Jabari Parker. Series Gala. Card Attributes Short Print (SP). Card Attributes Autograph. Card Attributes Refractor. Card Attributes Serial Numbered. You are Buying a 2015-16 Panini Prizm Jarell Martin Red, White & Blue Prizm Refractor Rookie Card # 301. Player Jarell Martin. Card Attributes Refractor. Card Manufacturer Panini. Player Jerryd Bayless. Card Attributes Refractor. Card Attributes Autograph. Card Attributes Refractor. Player KEVIN LOVE. NO RESERVE! 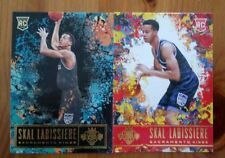 2016 PANINI NBA PRIZM. PURPLE PRIZM ROOKIE REFRACTOR /75. Card Attributes Refractor. Card Manufacturer Panini. Era Modern (1970-Now). Card Attributes Refractor. Original/Reprint Original. Product Single. League NBA. 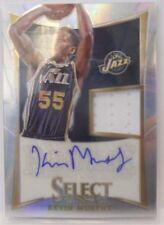 You are Buying a 2015-16 Panini Select Jarell Martin Short Printed Gold Prizm Autograph Jersey Rookie Card # RA-JMT. Player Jarell Martin. Card Manufacturer Panini. The Jersey Piece is All Dark Blue with a Dark Blue, White & Silver Patch Piece. 2015-16 Panini Spectra Spectacular Swatches Autographs Blue Prizms #SSJG Jerian Grant - Rookie Card - Serial Numbered 142/149. Player Jerian Grant. Team New York Knicks. Series Spectra. Card Attributes Rookie.